Today I had lunch with my good friend, Danita. 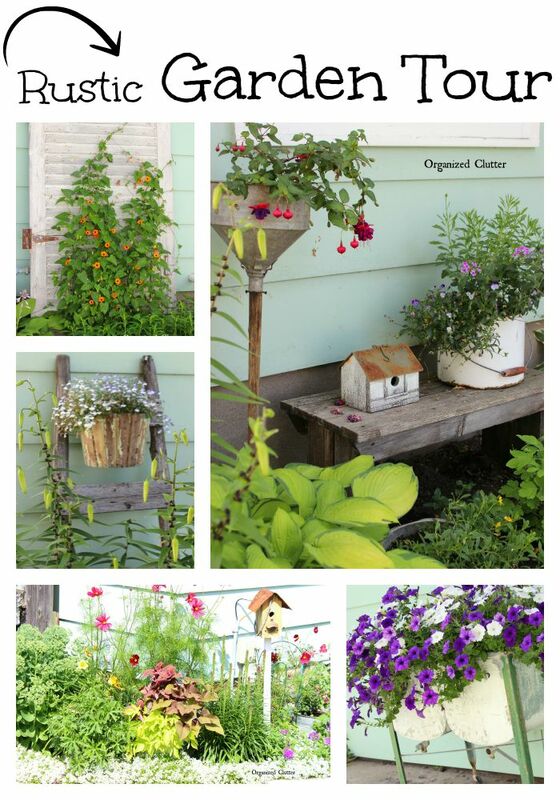 I brought my camera along hoping to share some of her rustic garden decor with my readers. Weathered wood, rustic birdhouses, funnels, and enamelware planted with annuals! All of the things I love in the garden. Here a wooden basket filled with lobelia is mounted on a weathered ladder for added vertical interest. Here perennials grow around and through an old rusty wheel. Danita has some the best old doors. This one has black eyed Susan vines climbing on welded wire. I have always wanted one of these for annuals. Danita says she only put two hanging baskets of petunias in the tubs. Not sure if any of you remember my old Menard's workbench kit potting bench or not, but this is it. When I used it as a potting bench, it was stained wood. I think I like it better in white! Today was a hot and very sunny day in northern Minnesota and so some of the photos on the southwest side of her house are a little overexposed. Foundation plantings of annuals and perennials are all around the house. More vertical interest with an enamelware pot on a weathered wood stool. Update: I returned to Danita's garden on a cloudier day in August and snapped a few more photos! I love this old door with a pig feeder planter! The flowers are very lush here in early August. I am so glad I stopped back for more photos. Danita's flowers look fabulous! I love having my junk gardening friends! How lovely! I really love the black eyed Susan vines on the door, and the tubs of petunias! Danita and you make a good team...super garden !!!! I especially like the old ladder and the shutter. This is a great yard! Mmmmmm. Pure loveliness So much inspiration here. You two are just so creative! I like the petunias in the tubs, as mine have died this year. Thanks for the tour, Carlene. I see so many fun and creative planters! The petunia tub is my favorite, they usually grow like weeds around here too.